Dolly’s tribute comes as part of her being honored MusiCares Person of the Year in the days leading up to the Grammys, a milestone moment for the country singer who’s racked up an astounding 47 nominations and nine wins, including this year’s latest honor. With a record that strong, it only makes sense that Dolly would perform a medley of her biggest hits with her best friends in the industry. The tribute started with Kacey and Katy, the first in big diva hair and the second in small, trading verses of Dolly’s award-winning 1977 single “Here You Come Again” before Dolly herself joined the singers. Looking angelic in her all-white gown and rocking a white microphone, too, Dolly thanked Kacey and Katy for their part in her tribute, as if they weren’t thrilled enough to be there already! “Where’s my Miley?” Dolly asked to begin the next portion, as goddaughter Miley came center stage for a rendition of Dolly’s timeless “Jolene” that was impossible not to sing along to. Blending their vocals, Miley kept the melody while Dolly dazzled on her harmonies – but the best harmonizing came right after. Dolly and Molly remained on stage as Maren joined them for a three-part vocal performance of “After The Gold Rush.” And as perfect as the three singers sounded right off the bat, it wasn’t until they went a cappella that you could really appreciate their voices – and it became clear that this was a moment to remember. 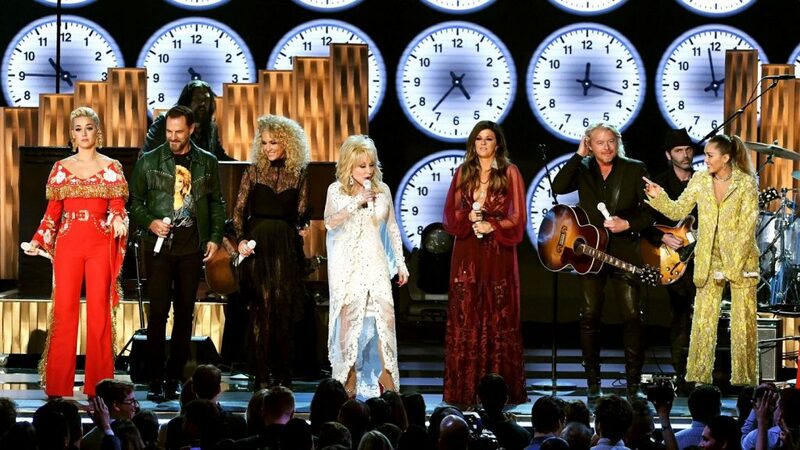 Little Big Town, who explained in multiple red carpet interviews that they’ve been looking forward to a Dolly collaboration for years and years, joined the superstar to perform her new song “Red Shoes” from the Dumplin’ Original Motion Picture Soundtrack, executive produced by Dolly herself. To close the tribute, Dolly kicked off “9 To 5,” her 1980 single from the movie of the same name, as each of the previous singers came back to the stage. And after Dolly gave her signature catchphrase – “Everybody!” – everyone sang together to close off a magical night for the country music singer. Songwriter Linda Perry accompanied on acoustic guitar, too, after the two collaborated on the Dumplin soundtrack. With so many of today’s biggest artists on the stage together with Dolly, one can’t help but wonder: which of these talented singers will get their own tribute in 20 years?! Look out for the answer at the 81st Grammy Awards.